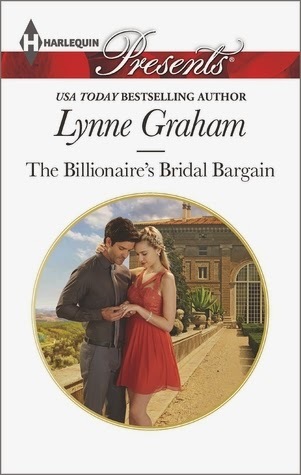 To get his hands on her Mediterranean island inheritance, Cesare must wed innocent Lizzie…and ensure she's carrying his heir! Luckily the formidable Italian is legendary for his powers of persuasion. With Lizzie desperate to save her family's farm, it's only a matter of time before she gives in…and discovers the many pleasurable benefits of wearing this tycoon's ring. AUTHOR BIO:Lynne Graham lives in Northern Ireland and has been a keen romance reader since her teens. Happily married, Lynne has five children. Her eldest is her only natural child. Her other children, who are every bit as dear to her heart, are adopted. The family has a variety of pets, and Lynne loves gardening, cooking, collecting all sorts and is crazy about every aspect of Christmas. I'd like to read it because I haven't read a good romance in a while. We attended a wedding with pie instead of cake. The pie was good, but I kind of missed that traditional cake.